The "Running of the Interns" is a time honored tradition for the DC media. Respective news interns spend their summer vacations standing in sweltering, swamp-like DC heat, waiting for Supreme Court decisions to be handed down. 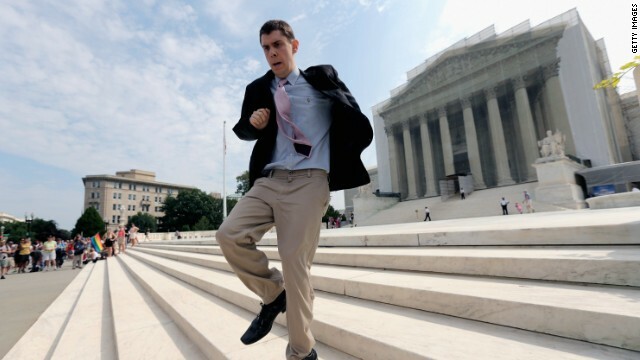 This year, though, one intern in particular drew more attention than others: Dan Stein, an editor of the Yale Daily News, became a viral sensation after numerous media outlets showed him racing from inside the Court's press room to hand deliver the Court's decision (and dissent) to his company's awaiting correspondent, Pete Williams. Stein was later interviewed on NBC's "Today" and told the morning show team it was "an honor to be part of the history." Irony can be a funny thing, especially when a collegiate program that is supposedly teaching students to edit their articles can't even seem to edit its own diplomas. According to Joe Carpenter, Radford’s chief communications officer, "1,481 undergraduate and graduate diplomas from fall 2012 and spring 2013 were misspelled." Michael Graczyk, an Associated Press reporter who has covered Texas executions since 1984, can't remember how many executions he has witnessed, and to be honest, he doesn't really care to anyway. He is, however, able to recall very specific memories - from one inmate singing "Silent Night" as the lethal injection coursed through his veins, to another inmate's "pretty brown eyes" popping open as he died. It's embarrassing enough to lose your job... but one British soccer club manager not only lost his job, but also lost his job on live television. According to Deadspin, Brighton & Hove Albion's manager, Gus Poyet "was officially fired when BBC producers printed out a press release from the team announcing the decision and it was read aloud for him on air." Jewelry is generally associated with money and dear ornament. Even so, you could create jewelry in your house. This is an inexpensive replacement for buying jewelry. Better still, generating your own bits enables you to modify the jewelry to help you target your bits to fit your clothing plus your style. Build Tasks for Grandkids and GrandparentsCraft concepts for grandparents and grandbabies are a good way to get rid of that age group buffer. Thankfully there are a variety of websites that provide no cost patterns and projects for many kinds of crafts in your case!The way to Earn Writing ProjectsTips to acquire huge article writing projectsFour Kids Composing Tasks With regards to SportsKids will often see composing as being a job linked to school.